The aerobic exercise zone is the intensity at which your body is using its aerobic metabolism system to produce energy from fat and glycogen. It spans the divide between moderate-intensity and vigorous-intensity exercise. In general, you must use your major muscle groups continuously, especially your legs, to bring your heart rate up into this zone. Aerobic activities include running, brisk walking, cycling, swimming, and rowing. Cardio exercise machines such as treadmills, elliptical trainers, stair steppers, rowers, and ski machines can all provide an aerobic workout. In systems that use five heart rate zones, the aerobic aone is zone 3, from 70 percent to 80 percent of your maximum heart rate. It is a heart rate where you can sustain exercise effort for a long period of time and get the benefit of improving your cardiovascular endurance. A wider definition of the aerobic zone is from 40 percent to 85 percent of maximum heart rate. Within this wide range you are using aerobic metabolism during exercise and the body doesn't have to switch to anaerobic metabolism. For cardio exercise, you want to be within this wide zone. To an activity to be considered aerobic exercise, you are doing sustained major muscle group effort for 10 minutes or more. You are breathing harder than normal to take in the oxygen needed for aerobic metabolism, but you are not completely out of breath. The aerobic zone is at the top of the moderate-intensity exercise zone (50 percent to 70 percent of maximum heart rate). This heart rate can be achieved with brisk walking. The aerobic zone is at the bottom of the vigorous-intensity zone (70 percent to 85 percent of maximum heart rate). This heart rate can be achieved by running or racewalking. You are able to exercise in this zone for a long period of time, first using glycogen for energy and then, after about 40 minutes, stored fat. Even people who have lean bodies have plenty of stored fat, unless they have been starving. This is why you can perform endurance exercise for long periods in the aerobic zone. You can replenish carbohydrates while you are exercising in the aerobic zone to keep the supply available to your muscles. This intensity zone is excellent for increasing the number and size of blood vessels in your muscles and improve your lung ventilation. As a result, your body is able to carry more oxygen to your muscles and take away waste products. You also will be burning stored fat for fuel, which is desirable for those who want to reduce body fat and lose weight. In the five-zone definition, the aerobic zone is a heart rate between 70 percent to 80 percent of your maximum heart rate. It is a zone where you are exercising at moderate to vigorous intensity. In this range, 50 percent of your calories burned in this zone are fats, 1 percent are proteins, and 50 percent are carbohydrates. You can measure your heart rate during exercise in several ways. You can take your pulse at your wrist or neck, counting for 60 seconds. There are apps that you can use to take your pulse on demand as well. But it is less disruptive for your exercise activities to use a heart rate monitor or pulse monitor. 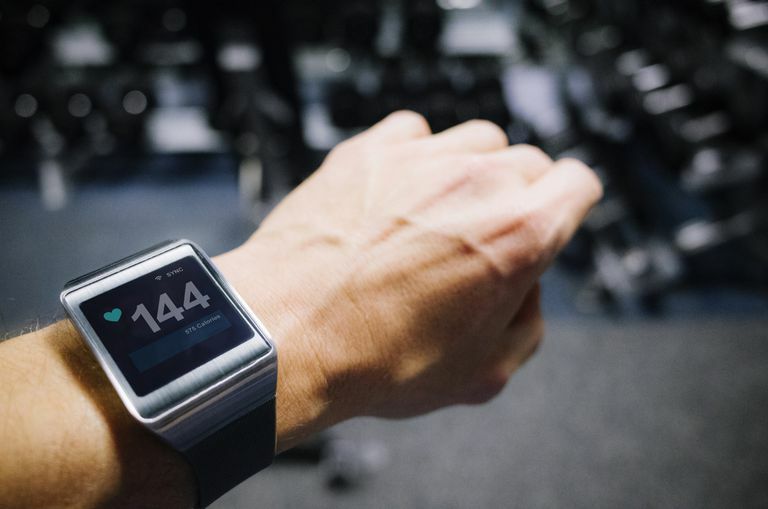 Pulse monitors are built into many fitness bands, such as the Fitbit Charge, and into smartwatches such as the Apple Watch. But it is more accurate to wear a chest strap heart rate monitor. You can see your heart rate and get alerts when you are in or out of the exercise zone, either on a phone app, fitness band, or wrist display. Target Heart Rate and Estimated Maximum Heart Rate. Centers for Disease Control and Prevention. https://www.cdc.gov/physicalactivity/basics/adults/index.htm.